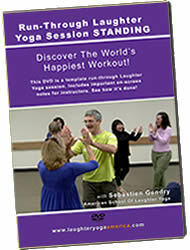 This instructional video is a run-through template Laughter Yoga session that will show you how this joyful practice is done standing up. Includes important on-screen notes for instructors. Laughter Yoga is a major development in the field of mood and health enhancing exercise. This video introduces you to a joyful practice in a group that combines simulated laughter with gentle yoga breathing techniques.